I haven’t been able to write my blog in a little while as I have been sew busy – pun intended! Katrine has a sewing machine and thought it would be a great idea to make her own costume for Halloween. Then Gregor wanted a homemade on as well. Well, needless to say, I ended up doing a lot of work on both which took a lot longer than I expected. Well, I expected it to take a long time as I am not a sewer, but it still took longer. So all last week was taken up with getting the costumes finished and good to go. Last year we decorated the front drive but the combined reasons that I was too busy and the weather was foul meant we didn’t this year. Just a lonely pumpkin sitting on the door step! The weather on Halloween was truly dreadful, bucketing it down and blowing a gale, so both costumes were only worn for an hour max before being abandoned for thick coats, hats, gloves and scarves. Regardless I am still very proud of myself (and Katrine – to be fair she did a lot, including the zip, there just wasn’t enough time for her to do it in time). 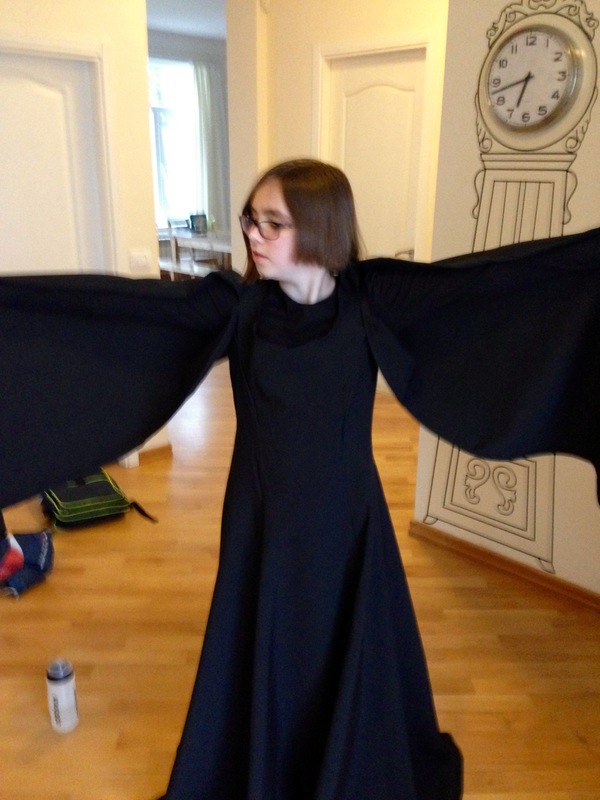 Katrine’s is dressed up as a Evil Queen using Simplicity 1551, which is a long dress with a train (perfect for wet weather!) with split sleeves. Supposed to be easy and great for beginners, well I suppose we did mange but we found it tricky, especially the shopping round the bodice. Katrine was in far too much of a hurry to pose for photos so this is the best that I got. 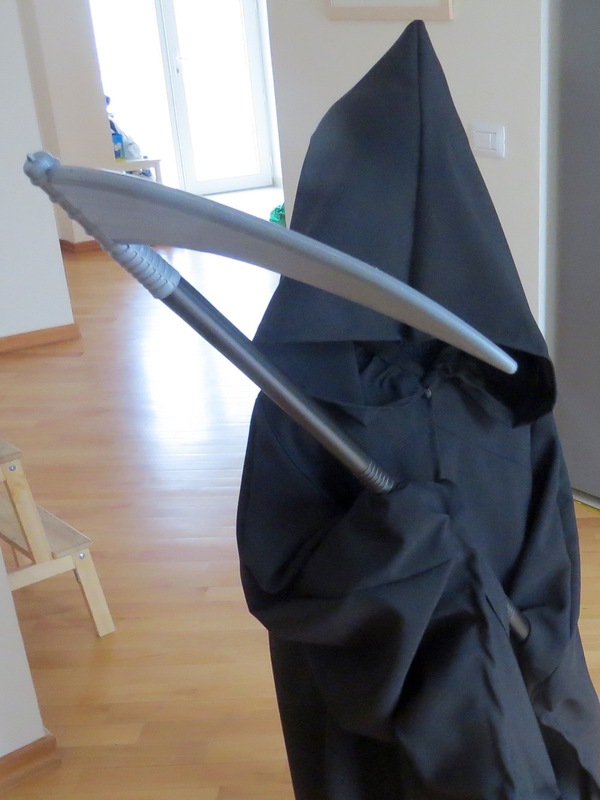 Gregor went as Death, thank you Tammy for getting him the scythe it really made the difference. This was also a Simplicity pattern 1582. We had to make it a lot smaller than the XS as Gregor is only nine, and again it trailed on the floor, which would be fine for dry weather but ended up soggy and cold. But it has washed up well and there is plenty of room for growth so it will do another year. I have said before, International day is my favourite school event. Always a great chance to get photos and see what a wonderful community we have here at TISA. This year there are 52 different nationalities from all continents, except Antartica. 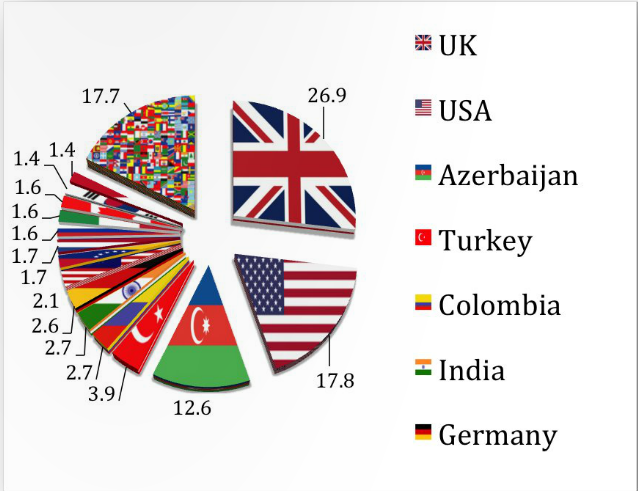 TISA Times, the school magazine, has this pie-chart showing where all the pupils come from. The day starts with a whole school assembly, there are about 700 pupils aged between 3-18. Last year the assembly was in the old gym, which was crowded, hot and it was very hard to see the stage. This year we were in the new gym, TISA5, which was a huge improvement. Plenty of space for everyone. The assembly started with the Azerbaijani national anthem followed by the parade of flags. Students were picked from both Middle and Primary sections (where there are enough numbers) and every nation at the school has a flag. Then onto the performances, all the primary classes performed, fortunately the upper classes were grouped together otherwise it would have over run by even longer! There was a second assembly in the afternoon, this is usually held outside on the field but Friday as the day the weather turned from summer to autumn, so it was back to TISA5. The Caspian Choir sang at this and there were performances from the Middle and High School students. Mr Alex being a true English gent, complete with cup of tea. Mr H (PE teacher) being understated in his country’s colours. Katrine and her friends with her maths teacher. The Azerbaijani teachers and staff singing the national anthem. P4 & 5 with their performance. Small cute people getting ready to sing. Some of the students performing a traditional Azerbaijani dance. Gregor and his class getting ready to sing, he has spotted me and the camera! Gregor singing with P6, 7 and 8. Mr Ruslam, one of the PE teachers, who has hidden talents as a dancer. Mr Ruslam striking a pose. The Caspian Choir performed in the afternoon assembly. There was also the celebration of food for lunch, which is Katrine’s favourite part of the day. I didn’t go this year to take photos but I had good feedback from Katrine and Gregor. Katrine couldn’t pick a favourite food – though she said the Chinese table was extra yummy, Gregor’s favourite was the scones from the British table! Holland – learnt about rivers and dams. Lebanon – wrote their names in Arabic and a dance. One thing that is very different about the weather here is how abrupt the season changes are. Back in the UK it moves very gradually between the seasons, with several false starts. Here it is almost overnight. This time last week it was 29 degrees, clear blue skies – the same as it had been for the last few weeks. This week there was hints that the weather was turning, there as a big storm Sunday night but Monday after a chilly start still 28 degrees. And then today. 13 degrees! Rain and wind! And that is pretty much the forecast from now on. Cloudy and showery with temperatures from 13-19 degrees. Bit of a shock to the system today, we also had a scurry around this morning trying to find trousers! They were tucked up at the top of the wardrobe. This weekend’s task will be to put away all the summer clothes. 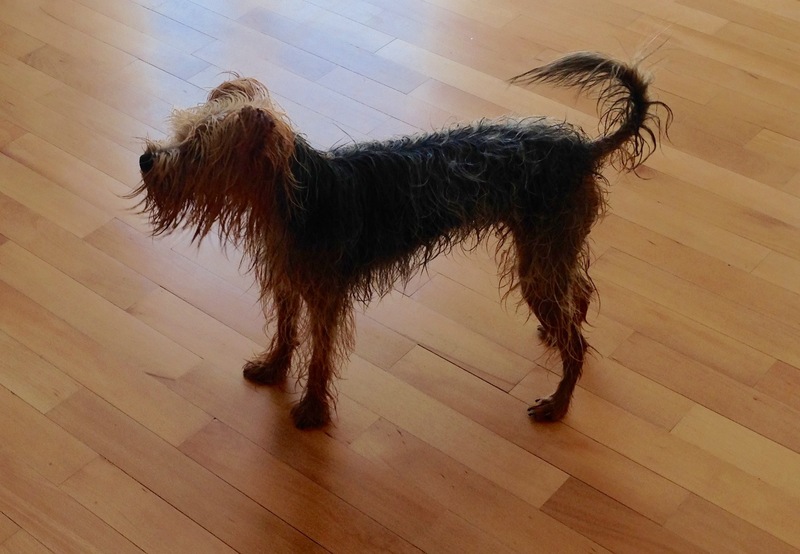 There are a few different places to get a dog’s hair trimmed here, but I have known people unhappy with all of them. So I decided it was a good idea to buy some clippers and learn how to do it myself. 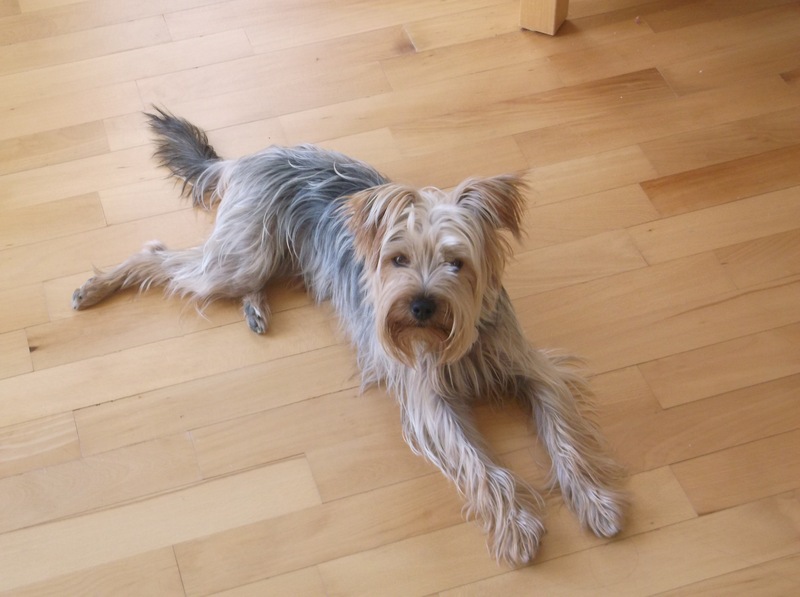 Now he is supposed to be a Yorkshire terrier but just look at those legs? Do they look very Yorkie like to anyone? We have fun trying to guess what other bread might be mixed in there, maybe some whippet? That would explain the slipping out when we open the front door and bolting it down the street! Great game, especially if some children can be persuaded to join in a chase him. So what do yo think – what types of dogs are in there? It is the simple things in life that can make the expat life great or at times rubbish. Fortunately this was one of the great times. Chocolate digestive biscuits! They are smaller than McVities and have a denser texture but they taste very similar and work just as well in a cuppa.